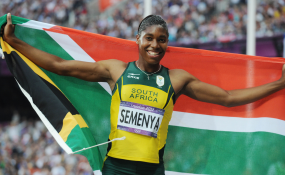 South Africa's Caster Semenya wins silver in the women's 800m finals (file photo). "The International Association of Athletics Federations (IAAF) is saying that [she] derives a sporting advantage from her naturally high testosterone levels. "As Numsa, we reject these ridiculous claims with the scientific contempt they deserve," General Secretary Irvin Jim said in a statement on Saturday. These sentiments from the union come after the IAAF changed its regulations last year so that women with high levels of testosterone would have to take medication to reduce their hormone levels before they will be allowed to compete in international events. Semenya is challenging the decision through a review process. She is not the only athlete potentially affected by the new rules - the two athletes who finished behind her in the Rio Olympics 800m, Francine Niyonsaba of Burundi and Kenya's Margaret Wambui, have also faced questions about their testosterone levels. "Will we now start cutting down the legs of tall basketball players because they have an 'unnatural' advantage, because of their height? "She has made incredible achievements without resorting to performance enhancing drugs, and in response, the sporting body wants to force her to pump unnatural, foreign substances into her body," Jim added. The Olympic athlete was in the the Court of Arbitration for Sports (CAS) in Switzerland this past week to challenge the IAAF's regulation. Track and field's governing body says it is introducing the rules to create a "level playing field" for other female athletes, News24 earlier reported. "We reject the research and pseudo-science which has been concocted to justify their bigotry and racial prejudices. We will not allow them to tarnish the legacy of our global sporting icon," Jim said. In a statement, the Lausanne-based CAS said the week-long hearing, which wrapped up on Friday, was "one of the most pivotal CAS cases" the tribunal has heard. The CAS is expected to rule on the matter by March 26. "As the largest trade union in South Africa, representing more than 370 thousand militant workers, we stand in solidarity with Caster and say #HandsOff," Jim concluded.